Nutrient pollution is one of the greatest challenges facing communities today. The U.S. Environmental Protection Agency (EPA) estimates that more than 15,000 bodies of water have nutrient impairments, including highly used recreational areas such as Chesapeake Bay and Lake Erie. Responsible for toxic algae blooms, an excess of nutrients in waterways can create conditions that destroy aquatic life and severely limit recreational enjoyment, accounting for millions of dollars in lost tourism revenue. As a result, as part of the Clean Water Act, EPA is implementing more stringent regulations in an effort to battle nutrient pollution, and municipalities are facing greater challenges in meeting these newly enforced limits. While compliance historically has been a significant driver of innovation, there now is also a strong interest within the water sector to advance sustainability and corporate responsibility. In fact, many wastewater treatment plants now define themselves as water resource recovery facilities (WRRFs), where water, energy, and nutrients are recovered and recycled for beneficial reuse. When phosphorus limits were first imposed, wastewater facilities commonly met regulatory limits by removing phosphorus using chemicals. The facilities precipitated nutrients with iron or aluminum salts and removed the precipitate via biosolids. This was an expensive process that generated excess biosolids and required the purchase of metals salts and the disposal of the metal phosphate sludge. Enhanced biological phosphorus removal (EBPR) emerged as an alternative across North America and Europe in the 1990s — EBPR has been available since the 1960s but wasn’t widely used. Unlike chemical phosphorus removal, EBPR is considered a low-cost, environmentally friendly solution that relies on special bacteria — phosphate accumulating organisms (PAOs) — to remove phosphorus. Issues arise, however, during anaerobic digestion, where PAOs release phosphorus and other nutrients. The released phosphorus can react with ammonia released in digesters and magnesium to form a scale, struvite. Struvite can cause severe buildup in pipes, process equipment, and digesters. To prevent this buildup, facilities again needed to resort to chemical phosphorus removal using metal salts, essentially turning the phosphorus back into a solid waste to be disposed of. In the 2000s, today’s prevailing technology emerged: Controlled crystallization of phosphorus into a granular highly pure high-value fertilizer. Researchers at the University of British Columbia understood that struvite had potential to be a valuable fertilizer when they developed the technology to extract the dissolved phosphorus, ammonia, and magnesium. 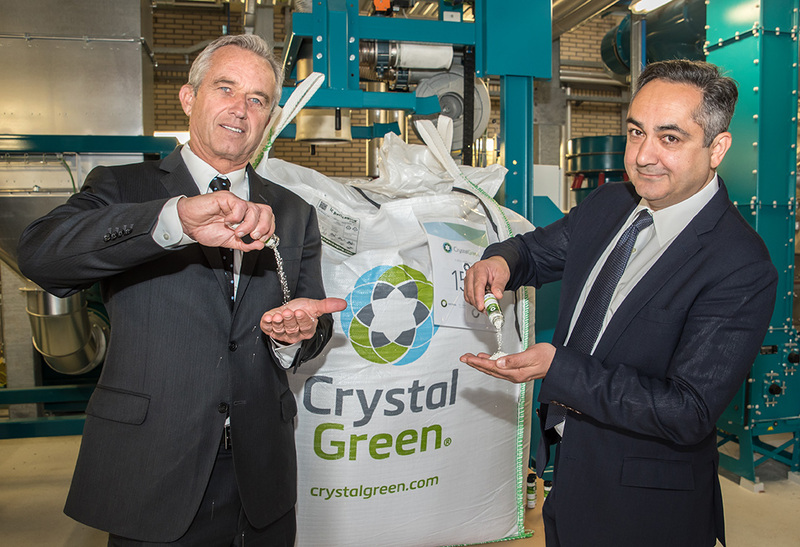 The technology carefully forms and grows crystals having the purity and size characteristics that would allow it to be blended and used as a commercial fertilizer. The technology was commercialized under the name Ostara Nutrient Recovery Technologies when the company was formed in 2005. In 2007, Ostara’s technology had been scaled up by a factor of 100, from laboratory to commercial scale. Again, 2 years later, Clean Water Services in Portland, Ore., launched the first commercial installation of the technology. Today, 12 facilities operate commercially worldwide, with more coming online this year. In May, the world’s largest nutrient recovery facility launched in partnership with the Metropolitan Water Reclamation District of Greater Chicago at the Stickney Water Reclamation Plant in Cicero, Ill. The facility has the production capacity of up to 30 tons/d of high-value fertilizer, sold as Crystal Green. The implementation of this technology at the Stickney facility is an example of how progressive technology and leadership can transform a wastewater treatment plant into a water resource recovery facility. This facility represents a significant shift in the wastewater sector to standardize recovery for reuse and reflects the evolution nutrient recovery has undergone. providing a guaranteed buyer for the product. The goal always should be to provide affordable business models to make new technology adoption financially attractive, as well as to quicken the payback to utilities. Beyond the challenges of scaling-up a technology and ensuring that it meets the treatment objectives required by a wastewater treatment utility, there is an element of alignment that is critical to building a strong partnership that gives both parties a true win–win. In designing the business model for nutrient recovery — and unlike energy and water resource recovery — it became apparent that wastewater utilities were neither properly equipped nor particularly interested in being in the commercial fertilizer business. To address this issue and achieve optimal and consistent value for the product, Ostara established a division focused exclusively on the development and maintenance of a market for the produced fertilizer. By consolidating production volumes and ensuring consistent quality, a branded product could be created. So, as part of every system sale, customers are provided with a long-term off-take for all of the produced fertilizer that, in turn, provides economic certainty and aligns both parties’ interests toward achieving maximum nutrient recovery. The technology provider benefits directly from the continued successful operation of a facility while the wastewater utility similarly gains from operating the system in an optimal manner. Through this alignment both parties have a vested interest in maintaining a strong and cooperative partnership. Innovation adoption can be challenging in the risk-averse water sector. However, recovery for reuse has shown benefits in enhanced operational efficiency, reliably meeting compliance targets, reducing operational costs (from maintenance and chemicals), and creating value from nutrients that would otherwise be lost. Those who have taken the perceived risk to date can attest to nutrient recovery as a win–win both economically and environmentally. Today, water utilities represent more than “treatment facilities.” They are energy providers and resource recovery centers. They carry significant pressures to innovate while also ensuring safe, resilient systems that protect both public health and the environment. As WRRFs continue to face increasingly rigorous phosphorus limits, nutrient recovery stands as an example as to what’s possible in reshaping the utility landscape.